Oftentimes it’s easy to believe that if something is a certain way here, it must be that way everywhere else. But we all know this is certainly not the case with local customs and cultures. However, sometimes we fall into this trap when it comes to alcohol in Ontario. Today I’m writing a new article category called Tales from Abroad. With this I’ll offer up how other jurisdictions handle alcohol, specifically beer. We are led to believe that the way beer is governed in Ontario is optimal and not worth changing. Understanding how retail environments operate in other areas will show that our system is certainly not optimal. Recently I took a trip to Chicago, Illinois. Illinois has a private liquor system, whereby alcohol is sold in private outlets – including corner stores, grocery stores and specialty stores. The state of Illinois does have a Liquor Control Commission, who authorizes retail and event licenses, and manages social responsibility programs including seller and server training, including underage checking. But I want to talk about a chain of stores called Sam’s Wine & Spirits. Sam’s has four locations in the Chicago area, and I visited the location in the South Loop of Chicago, on East Roosevelt. Upon entering the store I encountered a fantastic selection of alcohol – wine, spirits and beer to top anything that we see in Ontario. But the selection was not surprising, this is common in the U.S. to have private stores whose selection exceeds that of the LCBO. What stunned me was the presence of an in-retail wine bar that Sam’s offered. 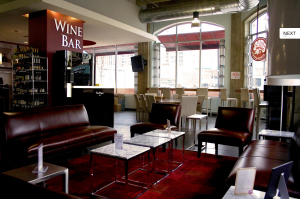 This wine bar, built into the retail space of the store, featured a high bar and multiple tables with chairs and couches. It was very nicely designed and comfortable, facing both the racks in the store and out onto the street. Now get this: at the wine bar, you are permitted to take anything that the store sells – be it a bottle of wine, champagne or beer, even food (they have a great selection of fine cheeses), have the bottle chilled by the wait staff and you can drink it right there in the bar. Not only that, you pay the retail cost of the products with no markup. Upon experiencing this it instantly became the best selection I had ever seen at a bar. I walked up to the shelf, grabbed a Jolly Pumpkin I had never had before, had it chilled and drank it while relaxing on a couch. It was simply incredible. They even offered recommended drink selections and cheese plates if you can’t decide on something specific. It was truly remarkable to see the creativity of Sam’s as a retail experience. Why should alcohol not be able to be enjoyed where it is purchased? This is not something that we ever see in Ontario. We are led to believe that alcohol can only be drank in certain locations. Buy it at the Beer Store or LCBO, take it home and enjoy it there. Sure, the LCBO hosts tasting events but would they ever set up their own bar for people to enjoy their products on-site? The LCBO has invested heavily in creating a sophisticated shopping experience, and this would be a natural extension of that. 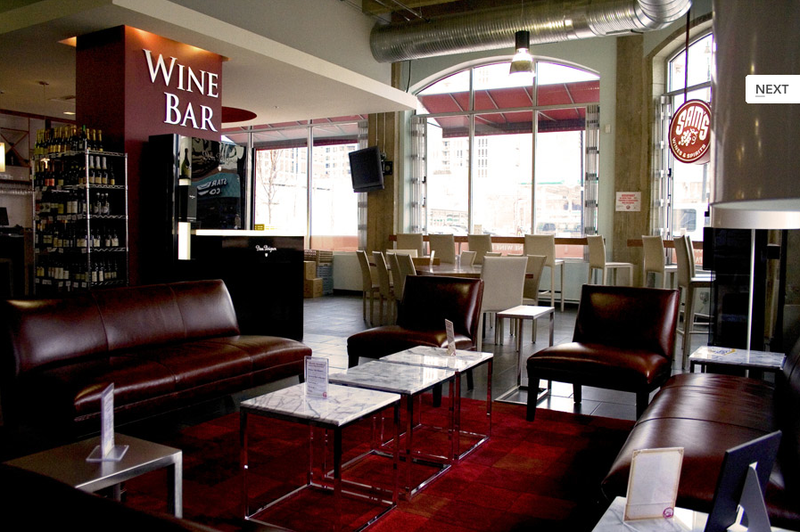 I doubt, however, that we will see anything like the Sam’s wine bar in Ontario. So remember, just because we are used to the “way things are” when it comes to alcohol in Ontario that does not mean that it should be that way. We will only be able to enjoy an experience similar to Sam’s under an alcohol system that is more open and free. And by the way, Sam’s also sells all their products online through their web site for home delivery. That’s a commentary for another day. What, and this relaxed atmosphere hasn’t led to drunken lawlessness on the store’s steps? Outrageous. At any rate, it wouldn’t work here. Ontarians are far to simple and childish for such an approach. Even though I’m “use to the way things are” I KNOW that it should not be that way. I also know, as you pointed out, that the innovation, client focus and product selection experienced at Sam’s Wine Bar will never be a reality under our public system. Responsible adults with different tastes will continue to suffer. The conservative manner in which our Province is operating when it comes to alcohol distribution makes me question whether the majority of our residents would ever make a choice in favor of the current overbearing and monopolistic system. I wonder if petitions and incessant letters to MPP’s outlining our distaste would remind everyone that we should be living under a democracy. The imposed control and restrictions over adult citizens “to protect us” does not make me feel great about our Government making choices for me. I agree that this store seems wonderful. However, having having travelled a fair bit in the US, for every store like this there are 20 stores selling the low end alcohol at “bargain” prices.